The Stir : Decisions, decisions. He invited me to the celebration. I couldn’t turn down the offer. We talked for hours over the hushed roar of the most popular Mexican restaurant in town. The entire drive home I worked hard to convince myself that I couldn’t fall for this one. He was about to take off on an adventure. 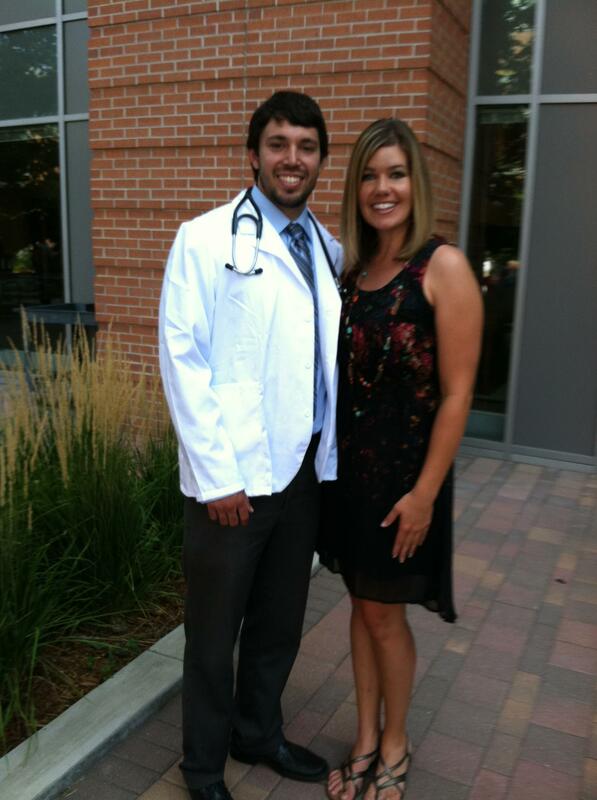 He invited me to his White Coat Ceremony. I couldn’t turn down the offer. Each member of the family was grinning ear-to-ear, so proud of their future doc. Savoring the moment, I also fought to corral my emotions. It could be four years before even the thought of buying a ring would cross his mind. He invited me to spend the rest of my life with him. I couldn’t turn down the offer. Eight weeks later, we said “I do” before friends and family. Vowing to love and care for each other in every circumstance. Our hearts were now one. This adventure belonged to us both. Time and time again, I moved cautiously toward crafting a post that would share a glimpse of our experience as Mike completes his Medical School training. Every draft has found its way to the trash. Earning an M.D. is a unique opportunity that is afforded to less than half of those who apply each year. The year my husband started school, he joined 19,516 other students nationwide in first-time enrollment. Within this small subset of the population, we found our way into an even smaller group: married in Med School. I was sure there would be rare moments I would want to record. Besides, it’s not everyday that one is awakened in the middle of the night by a husband who is just coming home from a double lung transplant surgery. And yet, this process is part of our life. It is part of our normal. The details might look a little different, but the reality is that we are working hard to chase after what we sense we are called to, just like so many others in a variety of situations. We are making decisions along the way, praying for the Lord’s wisdom. Eight months and twenty one days stand between this evening and the day we find out where we will spend the next chapter of life. There is so much to consider at this point in the process and I know that the only way we will see clearly is to humble ourselves before the One who set our existence in motion. As little kids, we must have read a book a thousand times that said, “Decisions, decisions. God made decisions.” Whenever there is a fork in the road, we still quote this line. As it plays on repeat in mind this week, my heart is quieted. I uncover joy when I consider that He has given us the gift of free will and perfect peace in knowing that He is faithful to lead us as we place our trust in Him.